In this day and age, everything is speeding forward as quickly as possible, especially technology. It’s hard to keep up with all the newest gadgets and how they work. It’s hard to know how best to use a product or if you even should at all. Of course, you can read “buyer reviews” but it’s really hard to know whether they’re true or were written by a hired writer. Buyer reviews can easily be (), so it’s better to check things out for yourself on other sites other than the one selling the product. Perhaps you’re just trying to figure how best to utilize your current Android product or are looking for the best way to drink coffee. There’s thousands of reasons to research information just as there are thousands of answers in the form of reviews, advice, and articles. If you like sites like LifeHacker, a weblog that fills its pages with software reviews and life hacks, then you’re going to love this article. 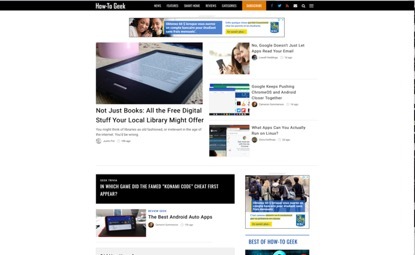 Here, we give you 7 sites like LifeHacker for great tips and tricks. Read on to find your where your next advice is going to come from! If you are looking for a lifehacker website, Gizmodo may be the one for you. This site features articles about science fiction, science, technology, design, and even politics. Called “Giz” for short, the site declares their love for technology, gadgets, science, and all kinds of toys, both big and small. They love smart and beautiful designs, dreamy architecture for both living and working in, fast aircraft, spaceships for reaching every corner of our solar system, and sleek vessels for sailing the world over, as well as science fiction, geek culture, and all things wonderful and weird that are loved by geeks. Above all, Gizmodo is a site full of articles about all these things. Recent titles include subjects such as listening to Saturn’s electromagnetic energy, bizarre glasses that cure motion sickness, and how vaping doesn’t help those trying to quit smoking as well as articles about Avengers: Infinity War and Castle Rock. 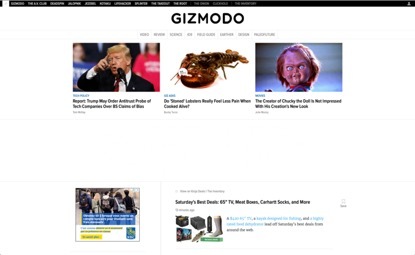 Check Gizmodo out for the latest articles on your favorite topics and learn something in the process. HowStuffWorks is an educational website whose main goal is providing their target audience insight into how many things work. The website actually got its start at a college professor’s kitchen table in 1998. From there, HowStuffWorks grew quickly into an award-winning source of easy-to-understand, reliable, and unbiased explanations and answers of how the world, and many things within our world, actually works. The site welcomes nearly thirty million visitors each month eager to learn what the writers, editors, podcasters, and video hosts have to share about the things they’re most excited about. In addition to daily articles, there are audio podcasts, videos, social platforms, and award-winning apps for iPhone and iPad as well as lifehacker Android app. 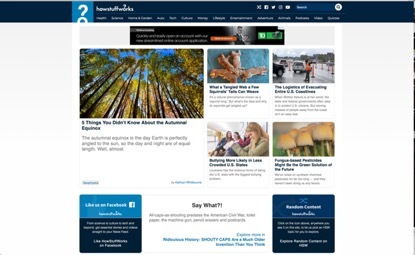 No matter now you want to check out HowStuffWorks, they have a platform (or several) that can accommodate you. Check out HowStuffWorks and find out just about anything right from you smart device or computer. If you are looking for answers to any questions regarding you tech, look no further. AddictiveTips includes explanations, answers, and tips for Windows, Mac OS X, Linux, iOS, Android, Windows Phone, Web, Office, VPNs and Privacy, and Kodi. 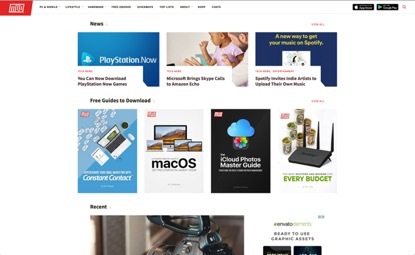 Articles on this website can be about things such as how to connect to Wifi with Android using WPS, how to create a system restore point on Windows 10, how to use Siri to view nutritional guides on iOS 12, how to enable root SSH login on Linux, and much, much more. Founded in 2008, this tech blog is focused on helping users find simple and free solutions to everyday problems. AddictiveTips provides daily hacks, tricks, guides, tips, and apps for users who are looking for this type of help. Face it, we aren’t all tech savvy and this site is for those of us who need help! The site also covers the latest in mobile apps, web apps, and desktop apps, as well as how-to tips and guides for all of the above mentioned platforms. Get the answers you need on AddictiveTips! Another site like LifeHacker is Dumb Little Man. 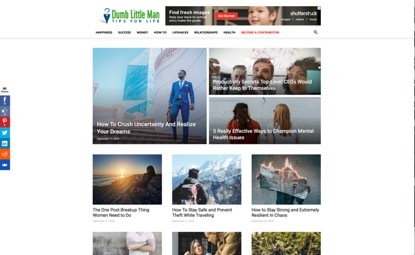 This sites offers advice which is often wise, provocative, and practical and allows readers to also contribute their own tricks, tidbits, and tricks. With categories such as happiness, success, money, how to, life hacks, relationships, and health, you can find a little bit of everything. Some of their most recent articles help you to learn ways you’re sabotaging your own happiness, how extended warranties work, Gmail tricks and secrets, and what debt collection technology updates there are and how they may affect you. Seriously, you can find anything from how to effectively clean your carpet to how to choose the credit card which suits you best. Check Dumb Little Man for the answers to your questions today! How-to Geek is basically an online technology magazine which explains every kind of technology you can imagine. It’s not just about the tech you think, such as phones, laptops, webcams, and Bluetooth speakers, but it also includes items such as coffee makers, kitchen gadgets, yard equipment, and portable air conditioners. If it’s electronic or tech related, you’ll probably find it on How-to Geek, along with good tips for your favorite tech gadgets that you can’t live without. Latest articles help you to add wireless charging to your vehicle, tell you how to get a smart thermostat from your electric or gas company, and how to use ADB and Fastboot on your Chromebook. Basically, if it’s tech, you can find it explained on this site. This site’s writers are professionals who not only know what they’re talking about, but can help you to understand better as well. For all your tech questions, go to How-to Geek! 1000 Life Hacks is a huge collections of tricks, tips, and, of course, life hacks, which will help in making your life so much easier. Like most life hacker websites, this site contains lots of categories to choose from such as tech, food, money, home, cures, health, funny stuff, travel, cleaning, school, cars, life tips, and party. This lifehacker website consists of tips and life hacks written in post-it note style, each containing quick sentences for quick reading instead of having to read an entire article. 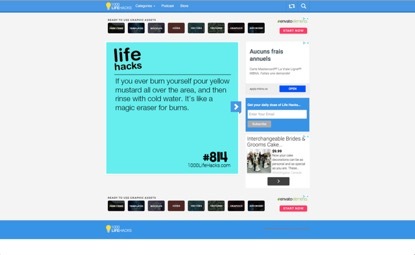 Check out 1000 Life Hacks by browsing the main page, selecting individual life hack categories, or watching a video. If you don’t have time for reading a lengthy article or just don’t like reading very much, this site offers the quickest way to learn life hacks. With the short sentences, you can learn lots of things in a very short period of time. If you want answers, but don’t have a lot of time for reading, 1000 Life Hacks is the site for you! MakeUseOf is another site that teaches technology, focusing on connecting users, computers, devices, and the Internet via education. Their mission is to help users break down the world of technology and gadgets. If you have any tech questions, this may be the site for you. There are many more titles as well. Before you buy a book, check here to see if they offer a free ebook. They also giveaway items they’ve reviewed. Currently they are giving away several tech products such as a fitness watch and pocket printer. The also have a category labeled “top lists” which is a sort of “best of” category, such as best web hosting services, and so on. MakeUseOf definitely offers lots of answers to tech questions and the free ebooks may really come in handy. Next time you have a tech question, check out MakeUseOf!